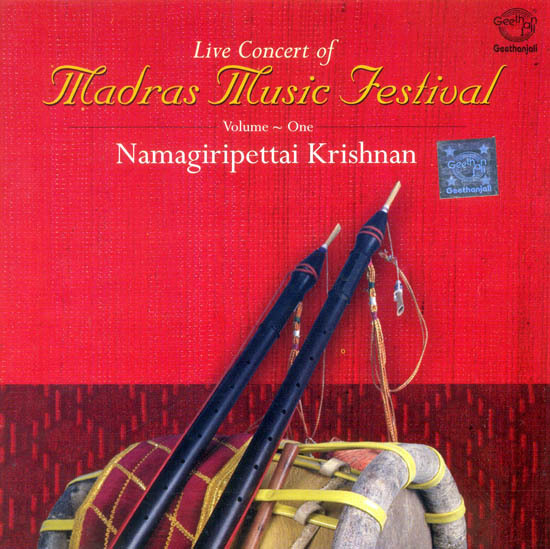 Namagiripettai K. Krishnan was born on April 2, 1924, and belongs to a family of musicians. He learnt his first lessons in vocal music and nagaswaram from his grandfather, Chinnappa Mudaliar. A pure traditionalist, Krishna is very keen on preserving the nagaswaram ‘bhanl’. His facile playing of his instrument brings out the full range, depth and melody of the music. This nagaswaram artiste is known for his handling of familiar carnatic ragas in their pristine form he has on ability to delineate rare ragas in short and sweet manner like his ‘alapana’ of the raga Kalyana Vasantam which is very much popular among his rasikas. Vidya Dathathi Vinayam” a Sanskrit adage suits Krishnan, as he is a simple, humble, very friendly and highly religious person by nature. Nadaswaram, also spelt as Nadhaswaram, and also called Nagaswaram is one of the most popular classical instruments of sought India and the World’s loudest non-brass acountic instrument. It is a wlnd instrument similar to the Shehnai but larger with a large flaring bell, sometimes metal. It may be swung through the air while playing creating a Doppler effect. In India the Nadaswaram is considered to be very auspicious and it is the key instrument which is played in all Hindu marriage and temples. The instrument is usually played in Pairs and accompanied by a pair of drums called “Thavil”.